The Saxony carpet Pile design will generally have a pile height of about 1/3”. This type will be made up of twisted, heat-set yarns with sufficient bulk or mass to cause them to stand vertical to foot traffic. 90% of the costly carpets made today are of the Saxony pile. The plush carpet pile design is dense enough to remain vertical to general traffic. This design, there is little or no twist set in the face yarns which consist of the pile. This presents a uniform, smooth texture on the face of the plush. This type of carpet can be sensitive to high temperatures in the cleaning solution, causing fiber distortion. Temperature settings should be turned lower from the maximum settings. The Shag carpet pile has virtually non-existent today, but still a number of shag pile carpets endure from the seventies. Usually, a shag carpet’s pile height is greater than an inch, but the other side of the story is there is so little density or bulk. It has a casual, random-lay effect. It won’t stand straight and thus the sides of the fibers are exposed to the traffic and wear and tear rather than the tips. The splush pile is mix between the shag and the plush. The pile height is generally less than an inch. It is denser than the shag pile but still is insufficient to stand upright to foot traffic. Although the density is highter than that of a shag, the same “random lay” visual effect is still evident. This design is of very tightly twisted yarns that give a rough visual effect. The Grass-pile carpets are generally made up of slit-film olefin. As the name suggests it fakes the appearance of grass in many different colour. 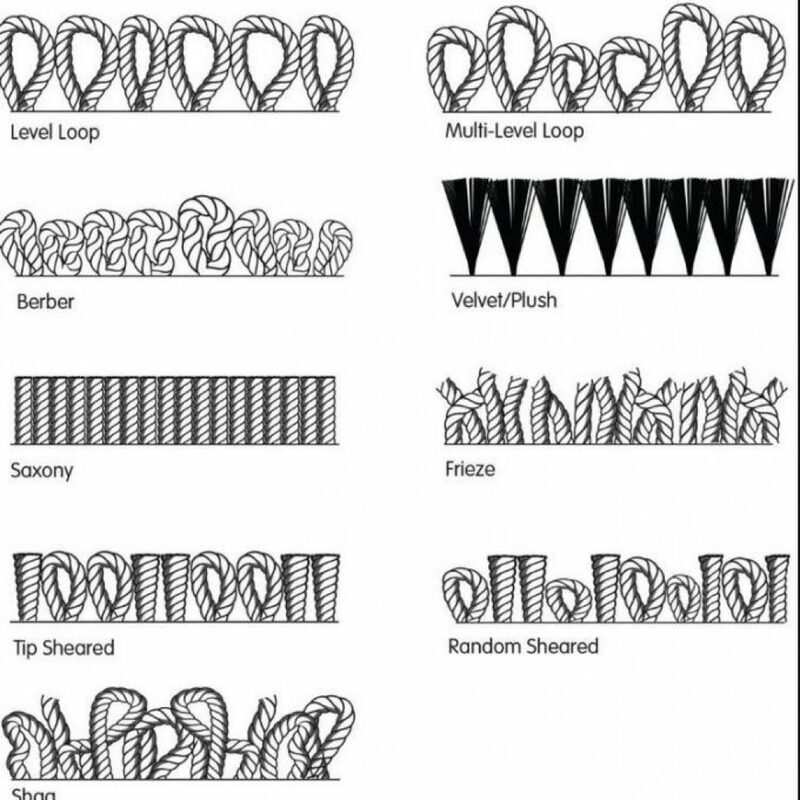 The level loop pile design is made-up of level tufts (uniformly) in a loop-pile or uncut pattern. This is widely used for commercial grade carpet. It is an advantage of having level-loop configuration with high density with low or minimum pile height. This formation is also called as “high and low” pile carpet. It is configured by applying increasing pressure/tension on to the yarn while tufting, thus forms patterns with multilevel high and low – loops. This SS design is of longer, cut-pile yarns in the saxony method. It is contrasted in texture by shorter, loop-pile yarns of uncut. This design is similar to the above SSaxony. It is made-up of high & less dense cut-pile yarns in a shag design. The difference is its lower-loops which remain uncut. This configuration is used to make a wide range of designs and patterns using cut and loop piles. Both patterns are of the similar height.